The Bluemoonistic Team traveled to western North Carolina on September 8, 2017 to ride the Great Smoky Mountain Railroad No. 1702 Steam Engine through the Nantahala Gorge! We stepped back in time on a fall day with typical Blue Ridge Mountain fog whirling around in the morning and watched it burn off as we continued on our ride. 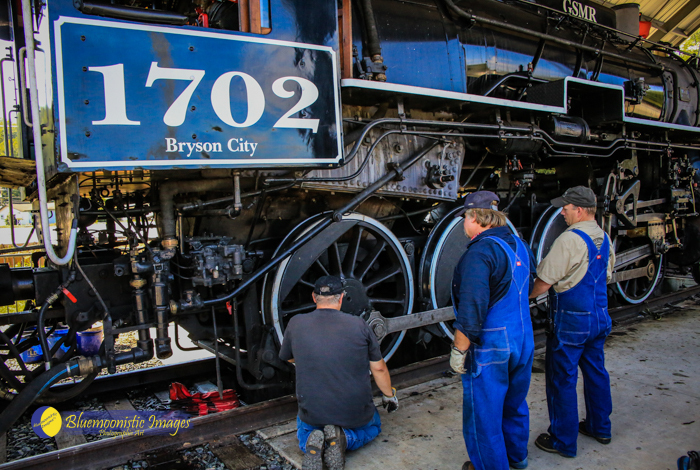 We boarded in Bryson City, NC, a town that has embraced its railroad heritage by bringing it back to life in today's world! 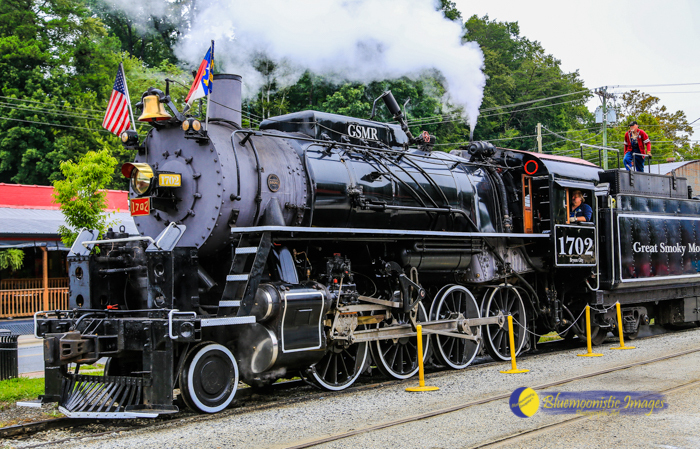 The Swain County Commissioners, their Tourist Development Authority and the Great Smoky Mountain Railroad formed a unique public/private partnership to preserve the 1702 Steam Engine and the construction of a turntable. What a visionary move on all their parts! They hired a crew of trained men and women to restore and maintain this steam engine creating another generation of skilled workers who know how to work on steam power! One feels a personal relationship with each and every team member as they allow you to watch them in action and answer questions! We had the privilege of talking with Dale Spivey, Buddy Hooper, Tony Franklin, Kurt Newman and Kenny Farley. This is truly using preservation in a way that keeps alive the past in today's world. No textbook needed when you listen to the expertise these gentlemen share. After the excursion, we watched them make adjustments and climb all over their beloved No. 1702 with care. It may be a dirty job but you can tell they go home at the end of the day with smiles of satisfaction on their faces! No. 1702, an S-160 model 2-8-0 steam engine, was built by the Baldwin Locomotive works in 1942 for the US Army and was intended to be shipped to Europe for the war effort. It never made the trip and spent the rest of WWII working at Fort Bragg, NC. After the war, No. 1702 changed hands with three different railroads in the Midwest and South before being purchased by the GSMR in 1991. During this entire time, No. 1702 was only temporarily idled, which likely saved it from both decay and being set aside as a museum piece. It was put into service with GMSR in 1992, but sidelined in 2004 due to firebox issues. Full restoration started again in 2014 and was completed in 2016, when it was again put into service for regular excursions on the GSMR. There are only seven remaining S-160 steam locomotives remaining in the United States, and No. 1702 is the only one that is operable. Along with the nostalgia of hearing that haunting steam whistle and the clickity-clack of riding along the rails of steel, you can watch them turn the metal monster around on the man-powered turntable when you get off. Then there is the train ride itself that fills you with picturesque views of the Great Smoky Mountains and allows you to feel the mystque that otherwise you can only read about. We were in an open gondola car that gave us the full experience as we rode along with trees sometimes touching the windows and rock walls passing within hands reach. One realized they dug a very small foot print to allow for rails to reach these ancient mountains. It had to be a struggle to carve out a place for trains to travel in this rugged territory. The Murphy Branch of the WNC RR began in Asheville and made it to present day Canton in January 1882, and Waynesville later that year. The staff on board were knowledgeable and kept us informed about sites and stories of things along the way. Our train came complete with a "Teller of Tales" - Tim Hall. His voice and local color delighted everyone on board! This is a man with true heart for preservation! Bringing the stories alive is his passion as part of the "Storytelling Center for Southern Appalachian in Bryson City". A striking observation for us since we live in a NC town that lost all traces of its railroad history in the 1970s when the railroad left and NC gave the land back to the original owners, is that the tracks of the WNC RR on this Murphy Branch were saved in 1988 when the state of North Carolina purchased 67 miles of track when the Rail Corridor Preservation Act was passed. We are truly grateful that this line was saved and enhanced through the years. The thought of this piece of history being lost makes us shudder. Museums are wonderful and definitely needed but to see the Great Smoky Mountain Railroad alive and well gives us living history! The benefits of that cannot be measured! Watch our video to hear the lonesome sound of the whistle from the Steam Engine #1702 and the sounds as we traveled on our journey!